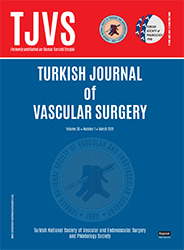 2Acıbadem Mehmet Ali Aydınlar Üniversitesi, Kalp ve Damar Cerrahisi Kliniği, İstanbul, Türkiye DOI : 10.9739/tjvs.2018.120 Objectives: This study aims to investigate the efficacy of endovenous laser ablation procedure in patients with varicose veins of great and small saphenous vein accompanied by long-term venous reflux and to identify mid-term recanalization rates. Patients and methods: Between February 2010 and August 2011, endovenous laser ablation was performed in a total of 105 patients (50 males, 55 females; mean age 42 years; range, 18 to 68 years) with great or small saphenous vein reflux. Laser ablation with varicose vein excision was performed to 95 of the patients. The patients were evaluated by Doppler ultrasonography at three and six months postoperatively. Results: The mean hospital stay was one day; however, 13 patients due to spinal anesthesia-related headache, low blood pressure, and fatigue stayed longer in the hospital. None of the patients experienced operative mortality. None of the patients had hematoma or hemorrhage, while local wound infection was detected in two patients. Postoperative Doppler ultrasonography revealed that the saphenous vein reflux was continued postoperatively in five patients (4.7%) (great saphenous vein in four patients and small saphenous vein in one patient).